For nights stationed in the nursery calming your baby or getting the little one back to sleep, you’ll want a place to sit that’s not only comfortable but supportive—and easy to get up out of without waking up your baby. We researched 22 glider chairs and narrowed it down to nine before bringing in some expertise in the form of real-life parents. In the end, the Nursery Classics Landis Swivel Glider won out as the best glider around. The chairs we tested came from seven different manufacturers. Among these are well-known brands such as Million Dollar Baby, Dutailier, Stork Craft and Klaussner, as well as smaller companies like Monte Design, Little Castle and Best Chair. We asked parents of babies to help us in testing how comfortable and supportive these chairs were. We had them practice getting in and out of the chairs to see if it would be possible to do so without waking a baby. This is a key factor that most parents didn’t think about prior to the test; instead, parents often look to color and style as the most important reason for choosing their chair. We landed on the Nursery Classics Landis Swivel Glider after hours of sitting, falling asleep, and waking up in various states of wakefulness. It had the higher back and arms, a swivel base, and was comfortable for parents of all different sizes. Expecting parents will want a comfortable place to sit with their babies, but the key here is the movement of the chair. We’ll discuss this more later on. Babies often require a little bit of soothing to fall asleep, and having a glider nearby gives you a place to do this. While you could stand and rock your baby back and forth in your arms, or bend at the knee over and over again, sometimes it’s late and you’re tired. The glider allows you to do all of this while seated, which should provide you with greater endurance for those extra-tough late night tantrums. A major difference between a normal armchair and a glider is the placement and structure of the arms and the back of the chair. Gliders typically have higher arms to support you when you’re either feeding or holding the baby above your waist. The higher back also comes in handy, so that when both you and baby fall asleep, you have somewhere to rest your head. The good: picking out a glider doesn’t involve lifting anything like a stroller, or carrying a car seat. Your main job is to sit and evaluate how comfortable and supportive the seat is. The bad: Many of these chairs will have to be ordered and will take weeks to get to you. In reviewing manufacturer websites, asking store employees, and looking on Amazon, this time could be anywhere from four weeks to 12 weeks depending on the brand and the season. There are some chairs available for immediate purchase, but these chairs typically come with pre-set options which are often less than ideal. If you decide a glider is right for you, be sure you set aside time in that four-to-12-week window to receive your chair. A good glider moves—or glides—smoothly, relaxing you and your baby. It should also have firm, supportive cushions that help prop you up when holding your baby. Unfortunately, picking one out is more complicated than simply seeing how well a chair glides, or how far it moves. What makes a glider a good fit for you may differ from what works for your closest friends and relatives. You’ll want to consider your size, especially your height, when picking a glider. Many of the gliders that we looked at had short backs that our testers felt lacked the proper support for the head, back, and neck. You’ll also want to test out the armrests. While it’s easy to say, “I don’t need 100 fabrics to choose from” or “I’d happily spend less to have fewer choices” most will appreciate the range of colors and fabrics. While some companies advertise hundreds of fabrics, trust me, you’ll be able to eliminate at least 70% of them at first glance. These include but are not limited to, “Neon Rhododendron,” “Annie Citrus,” and “The All-New Luna Denim.” (But whatever floats your boat!) You can also order swatches from manufacturers if you’d like to see the color in your nursery space. The harsh lighting of your local baby superstore may not provide the best representation of the fabric you chose. We knew from the beginning that we were going to need some help with this guide. We asked real parents of all different shapes and size to assist us in picking out candidates as well as testing them out. We started off with a list of twenty products and began whittling down the list based on customer reviews. Armed with a list of nine gliders, we graduated to hands-on testing. There are four major elements that we considered. First, the glider should be comfortable and supportive. Second, it should be comfortable and supportive for long periods of time including but not limited to daytime naps and more substantial nighttime sleep. Third, it should be easy to get in and out of, as to not upset the occupant or the baby. Fourth, it should feel sturdy and come in a durable fabric that can be easily cleaned. When buying anything for baby, it’s important to consider your warranty coverage. Most companies offer a one-year warranty on the entire chair. This includes the rocking or gliding mechanism, the fabrics, the base and pillows. Our pick, the Nursery Classics Landis Swivel Glider, has a one-year warranty on the fabrics and a lifetime warranty on the frame of the chair. We started by putting our test subjects into the chairs for brief periods of time, holding in their arms whatever they had with them—a heavy purse, diaper bag, a child, etc. This gave us an immediate opportunity to see which gliders didn’t have high enough arms to support this weight. Next, we asked the parents to get in and out of them, as smoothly as possible. After that, we had them pick their favorite chairs, and stay put for an extended period of time—thirty minutes or more. It was clear to us at this point that there are some glaring differences between the products, and a few features really stood out. We love the multi-position lock feature that can be found on many Dutailier products. This enables the parent to lock the chair in a variety of reclined positions, or to engage the lock in the upright position to aid them in getting out of the chair. A parent also told us that the lock is great for when you have multiple kids, because you can lock it when it’s not in use, preventing curious toddlers from playing with the glide mechanism and potentially getting their fingers caught or pinched. Our testers emphasized that the higher seat back was super important to them. We occasionally saw our testers’ heads tip forward, as they temporarily dozed off. The downward head position when seated led to snoring and left some parents with sore necks. The higher back chairs gave parents a place to rest their heads, which everyone agreed was a crucial attribute in a glider. After hours of this testing, the Nursery Classics Landis Swivel Glider came out on top. It has a tall backrest, well-positioned armrests, a swivelling base, and a good seat depth that made it easy to get into and out of. We appreciated the many fabric choices, and the optional contrast piping, which are welcome options that only add to the chair’s appeal. Each parent was able to sit in this chair comfortably, with enough space in every direction, while still feeling snug. This is thanks to the slightly shorter-than-average depth and narrower armrests. A few of our testers confessed that they’d used an old club chair, armchair, or rocking chair as the seat in their nurseries; after some time with our pick, we’re certain that they’ll be considering ordering a Landis. We appreciate that the chair’s seat cushions are made from BiOH foams. These are derived from soybean oil instead of the standard petroleum-based foam that we usually see in furniture cushions. The production of this foam requires less energy as compared to their petroleum-based counterparts, and thus this foam is more environmentally-friendly. Our pick starts at $680, and for an extra $335 you can add a matching gliding ottoman. The price of the chair does go up based on your fabric choice—up to $785. As for the price breakdown, the fabrics are broken up into three grades: A, B, and C. To make it easy, the vast majority of the fabrics—about 80% of them—are “A” level, and go for $680. The B and C level fabrics are more expensive due in part to them being multi-colored patterns or limited-run fabrics. All chairs, regardless of grade, include a matching pillow and piping. The color is your choice. This chair can be found online or in stores in just about every state. Like other baby furniture items, this one can take some time to order from your local store. You can expect this to take four to eight weeks to deliver, depending on the retailer and your proximity to North Carolina, where these chairs are manufactured. Our pick is a new addition to the Nursery Classics line, and doesn’t as of yet have many reviews online. That said, the rest of the Nursery Classics product lineup has received very positive ratings and our pick is made from the exact same stuff. On Wayfair.com, we find glowing reviews of the line that included notes about the “very sturdy construction with fabric that can be easily cleaned” and “substantial fabric.” Also, many reviewers said in one way or another that the chairs are comfortable yet supportive. SSome of our testers preferred the more traditional looking sleigh gliders. For parents in this camp, we like the Dutailier Modern Round Back Glider Combo, which retails for around $550. This chair comes well-equipped with a multi-position lock, reclining mechanism, washable cushions and a matching gliding ottoman. There are four colors to choose from, all available on an espresso-stained wood base. At any store, or online, it’s common to spot gliders made by Dutailier. They make wooden and upholstered chairs, but are best known for their wooden sleigh gliders. These run in price from the $300 all the way up to $900, depending on what features you’d like to have. We especially like their optional multi-position lock, which enables you to stop the chair from moving. This is helpful if you want to place the chair into a more reclined position, or it can be used to aid in getting out of the chair. The one consistent complaint was, that in a field of modern gliders, or other upholstered chairs, that the sleigh style screams “baby” and not “living room”. However, at $525, they are a great value, especially for those who consider an ottoman to be an essential part of the purchase. There are those who want a showstopper of a glider, and for those, we recommend the Monte Design Grano Recliner. Starting at $1195, the Grano is a svelte glider and offers one of the firmest cushions available. With a pull of the concealed handle you can pop up the leg rest and push the back into a full recline. When this is fully engaged, the seat locks into place. The bonded leather option is an extra $200, and is available in white, black or chocolate. In addition, you can buy the chair with the standard wood base or a swivel base, which helps give you more room to recline the chair or fit it into a corner. Our test group liked the bonded leather option the best, and found that it could easily be wiped clean. Not only were liquids easily wiped off of the surface, you couldn’t tell that they had ever been there in the first place. The downside to this chair is the longer than average seat depth, which made it anywhere from an inch to three inches deeper than the rest of our candidates. This was great for taller and long-legged parents, but didn’t work out so well for our shorter ones, who found getting out of the chair somewhat jerky. We had a set of parents expecting twins in our test group. This presented an unexpected twist seeing as most gliders and rockers are truly designed with one kid and one adult in mind. There were also a small group of parents who told us that they’d like a chair for a baby and a toddler. Other parents just wanted a place for two people to sit down beside one another. In our testing, the Dorel Asia Double Rocker was our pick as the best chair for twins and for siblings. We tested three different models which ranged in price from $320, up to $1000. Our pick was the clear winner. In addition to the larger capacity, it’s easy to clean with microfiber fabrics, and it costs half as much as two other options. On top of that, it was the easiest to set into motion, a crucial feature with a chair of this size. It has a 33-inch-wide seating area, with a wooden base. We found that with one adult there was plenty of space to lounge, and we could even fit two slim adults. (It’s a bit of a squeeze for two adults and a toddler to fit in.) Some context: most loveseats have a seating area of at least 44 inches. We tested this rocker out with a five year old next to an adult, and there was enough room for him to sit up or to lay down for story time. One complaint from our testers is that it didn’t rock as much as a normal rocker or glider. Part of the issue with any of these chairs is that your body sets the chair into motion. Having the exceptionally wide and heavy base will be harder to rock, but it will give you room for yourself and multiple configurations of young children. Best Chair Co. Tryp—This chair is typically only found in boutiques and online. Our gripe was that when the chair was in the recline position, it didn’t lock. This turns the typical stand-up exit into more of a rolling maneuver. 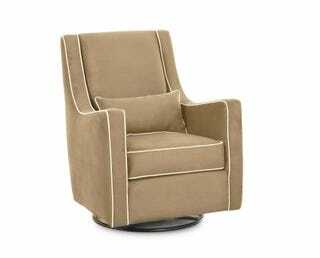 BabyLetto Madison Swivel Glider—Highly rated online and we don’t know why. As soon as you start to get tired, you’ll notice that there’s nowhere to rest your head. StorkCraft Hoop Glider—There are 171 1-star reviews on Amazon that pick this chair apart. The complaints include: Poor quality wood and fabrics, chairs falling apart, no one answering the customer service lines and missing parts. Dutailier Etna—Had the highest seat back, but didn’t fit our shorter testers well. It’s also expensive, given the lack of a recline. Nursery Classics Marlowe—This chair too had a low seat back, leaving nowhere to rest your head. It’s wide, and the seat itself was too narrow for some of our testers. Gliders and the ottomans that you can purchase with them are like all other upholstered furniture in terms of getting dirty and stained. Spot-cleaning is the preferred method of clean-up, and can be done using a mild soap and water solution with a cloth. You’ll want to test out your solution on an inconspicuous spot, to make sure that you won’t be permanently doing any harm to the fabric or coloration. Blot dry, and your chair should look brand new. For wooden bases or frames, dust often with a soft dry cloth. One piece of advice: avoid lighter colored piping if your chair offers it. In our tests, all of the chairs that we looked at in stores with white, or off-white piping were actually closer to grey or tan. This is because the natural oils of our skin rub off and discolor them. Again, it’s important to find a chair that fits you. Pregnancy results in increased stress on the body and changes in weight distribution. After delivery, a mother’s body can...shift. Having a good chair that supports the back, legs, and spine can only help speed up recovery, and provide comfort and support. It’s easy to underestimate the value of a glider. You might say, “We already own chairs—several of ’em!” But a glider can make a huge difference in your nursery. What sets a glider apart from a normal chair is that a it has higher arms to support the weight of a baby and a restful gliding motion to soothe both you and the baby when it’s needed. Both of those features are crucial for your comfort as well as baby’s. Nursery Classics Landis Swivel Glider met the needs of our testers and exceeded their expectations of what a glider could be. It’s affordable, it’s customizable, it’s made in the USA and can be purchased with or without an ottoman. Above all, it was easy to get into and out of without a lot of jostling, and this is the most important thing to consider when buying a glider.